A softphone is a software program that can be installed on your computer or a smartphone device. 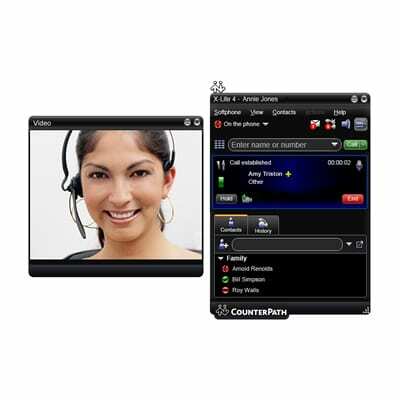 You can use a softphone to make and receive phone calls using VoIP (Voice over Internet Protocol). Sometimes this program can run even inside your Internet browser. There are many different smartphones made by different software vendors. They come in all shapes and colors and vary in their capabilities. SoftPhones connect to the PBX phone system just like any desk phone. If you are a traveling worker – softphone will give you complete access to all the PBX features. Check your voicemail, forward calls, control find-me/follow-me feature, record greetings, enable or disable call recording and much more. SoftPhones don’t really replace desk phones. They lack the convenience of the desktop handset because they are running on a multipurpose device. Take the SmartPhone, for example. This device runs other unrelated software that could also introduce software conflicts when trying to access the smartphone’s or computer’s microphone, speaker or network connection. Under the right configuration and in proper circumstances they serve as powerful enablers of the Hosted PBX technology.